← What Ails Education in our Business Schools? India’s software services sector is bracing for the consequences of US President Donald Trump’s crackdown on immigration, which include the restrictions on so-called H-1B visas. Having won the presidency on the promise of protecting US jobs and against moving work offshore, Trump through his reforms restricted the flow of immigrants and temporary labourers into the US workforce. H-1B visa is an employment-based, non-immigrant visa that allows US companies to temporarily employ foreign workers in specialty occupation. Indian IT firms and H-1B visa aspirants will be badly affected due to changes proposed by the Trump administration. However, this reform doesn’t affect the Indians, settled in America who therefore being an American citizen enjoy all the benefits. The American authorities have raised the minimum salary from 60,000 USD to 130,000 USD per annum with additional restrictions on the employer. And therefore, doubling of the minimum wage applies to “visa dependent employers” who send the workers for a short period say 1 or 2 years from India. Thus, Indian companies have to send those people who are really worth the minimum wages. An opportunity to “work onsite” and “earn in dollars” has been a big lure for Indian Techies. But the Americans want only those specialized US workers to occupy those high-skilled technology works and the remaining jobs to be filled by local Americans. However, there is nothing to worry about because the local American cannot become excellent techies overnight. The US government have received about 250,000 applications for H-1B visas – with a majority of them being from Indian companies. Of nearly 85000 H-1B visas granted in 2015, 55900 visas were issued to engineers, designers, coders and others from India. This shows that the majority of tech worker in America are indeed no doubt Indians. The new bill introduced by trump in the US House of Representative, made it difficult for the firms to grant H-1B visa as it is quite expensive. Furthermore, nearly half of the techies are actually working in India on the American projects. And therefore the problem is not the visa or the immigration laws. The exact problem lies on the shortage of appropriate manipulative skills which can take the country, workforce and economy from traditional one to a digital world. The reform will affect the profits of Indian IT companies in US. Because the new H-1B Reform Bill has doubled the minimum wage requirement of H1-B visa holders from $60,000 to $130,000. This change could turn into a major catastrophe for Indian companies and workers, as it would make it financially unviable for Indian workers to be hired in the US. This automatically negates one of the biggest reason for hiring Indian workers – the availability of cheap labour. Due to the new reforms, Indian IT companies will not be able to send local engineers to work in US, for a very high salary. With the new mandated levels, Indian workers must be paid more than the American workers, making them a costly proposition. Moreover, it will be difficult to get them back home and make them work for the same salary. Even when they tend to work– they will feel more dissatisfied. Changes in the H1-B visa arrangement will add immense cost pressures on IT firms. IT companies in India that enjoy significant cost advantages by sending Indian engineers to the US for a lower salary, are likely to be affected. H-1B programme was initiated on premise to complement America’s high-skilled workforce, but not replace it. Unfortunately, many companies are trying to exploit the programmes by cutting American workers for cheaper labour. The restrictions on H1-B visas, is most likely to affect small firms more than large outsourcing firm. Since the process is expensive, small companies do not even dare to apply for these kinds of Visa. Though the start-ups and emerging companies dare to innovate and progress, because of the high expense of acquiring the H1-B visa, the smaller companies tend to step back. Unlike other countries like America, France, etc., there is no provision for start-up visa and thus, the companies daring to do something new can enjoy these benefits. India’s one of the biggest outsourcing industry, Information Technology contributes around 9.5% to the country’s GDP and employs nearly 3.7 million professionals. And due to unfavourable developments in key markets, the industry faces difficulties on home-ground because of higher Operational Costs. 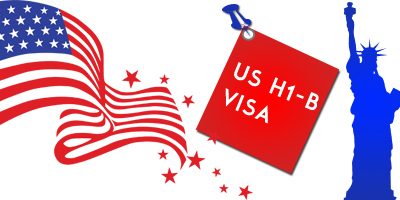 The US government allows upto 85,000 new H-1B visas each year but the demand is usually higher than the supply. NASSCOM, the industry body for software and services companies is planning to send a delegation to the United States to negotiate and discuss on these issues. Meanwhile, India discussed several issues, including the proposed restrictions on H1-B visa with the US lawmakers. The negotiators have to find an effective solution that does not hurt our economy, technical department and Indian IT companies. Many social media companies like Facebook, LinkedIn, Twitter, Google, etc. have emerged to be successful in a very short span of time. Companies are automating jobs and seeking innovative technology to remain competitive. This kind of innovation has to be inculcated even in Indian Companies. Consequently, India has to inject the culture of innovation. This entry was posted in Personality development and tagged America, Coders, Designers, Earn in dollars, Engineers, Facebook, France, Google, H-1B visa is an employment-based, Information Technology, LinkedIn, NASSCOM, Short-term challenges, Social media companies, Twitter, Uncertain future, Visa dependent employers, Work onsite. Bookmark the permalink.